Serena Williams faces another Russian in Anastasia Pavlyuchenkova as she continues her search for Slam #22 on Tuesday in the Wimbledon quarter-finals. Serena was once again tested as her fourth round opponent, Svetlana Kuznetsova served for the first set at *5-4. Serena had been up an early break but lost her way and the ascendancy with an ill-timed drop shot as she was forced into the splits. The world number one immediately broke back before the rain started to fall. The players went off and the roof came over, despite play not being halted at the same time on the outside courts. 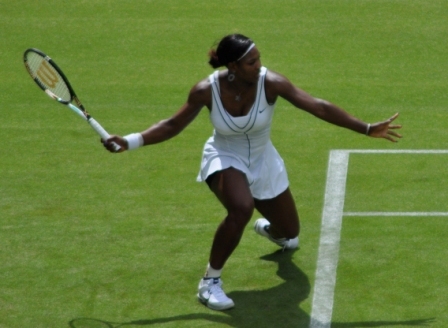 On the resumption, Serena absolutely powered home, winning the final eight games of the match. In hindsight, Kuznetsova should have probably argued about the roof coming into play as it was only a brief rain shower. Serena was sensational in the second set, dropping just five (!) points in the second set in a 7-5 6-0 victory. Pavlyuchenkova broke new ground on Middle Sunday by reaching the second week of Wimbledon for the first time in her career. She went one step further by beating the in-form, CoCo Vandeweghe to reach a first Slam quarter-final since the 2011 US Open. I’ve said this on so many occasions that Pavs is one of the most talented ball strikers out there, but she’s often struggled beating the lower ranked players that you would expect her to beat. Pavs has her fair share of top ten wins but it’s been getting to those matches that is often the problem! Pavs was superb against Timea Bacsinszky in the third round and kept it very clean against a wayward and erratic, Vandeweghe in the fourth round. The American was serving at just 49% first serves in and won barely half the points on her serve, which has been so effective during this grass court season. Pavs hit fewer winners than Vandeweghe (13 to 18) but three times less the number of unforced errors (7 to 22) to finished with positive stats. "She is still simply the best"
Head-to-head record: Serena leads Pavs in the head-to-head, 5-0. The Russian player won a set in their first very match-up in 2010 at the French Open. Since then, Serena has won their last four matches all in straight sets with at least one 6-1 set in all four matches. Interesting stat: Pavlyuchenkova has won back-to-back matches on just five occasions this year. Her run at Wimbledon is the first time she has won four matches in a row since Moscow in October. July 4, 2016 in Pavlyuchenkova, Serena, Wimbledon, WTA.